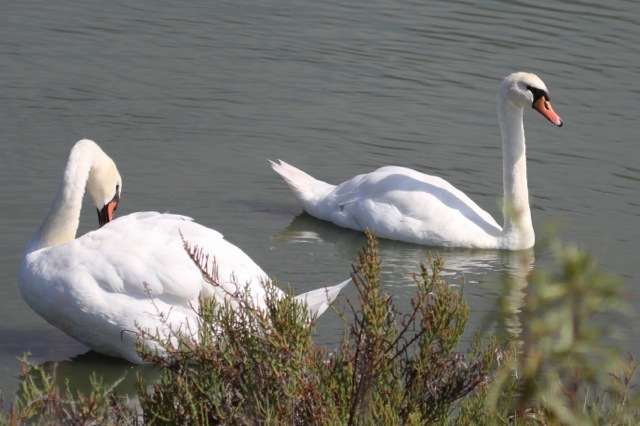 Local birders were surprised when two Mute Swans appeared at Malibu Lagoon on July 31st , 2015, and were still there September 6. They rest primarily on sand islands in the channel, but can be seen swimming anywhere in the lagoon or channel, rarely far apart. A local Malibuite told me they had first been seen next to Pacific Coast Highway, and the female had been dinged by a car. She was only slightly bruised, and the pair were reunited and taken to the lagoon. They both have full sets of flight feathers; neither had any bands or tags. Locals are already calling them Romeo & Juliet; one added: “In England they are protected by the Queen.” If any readers know any more about the origin of this pair, please send it to me & I’ll update this post. 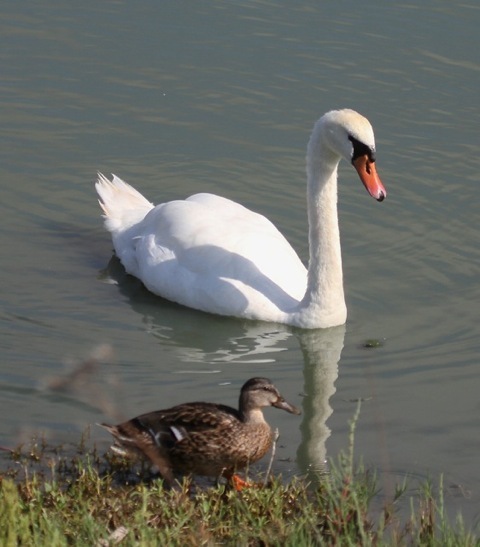 Late-breaking local swan information, as promised: Mute Swans live on Lake Sherwood and Westlake Lake. 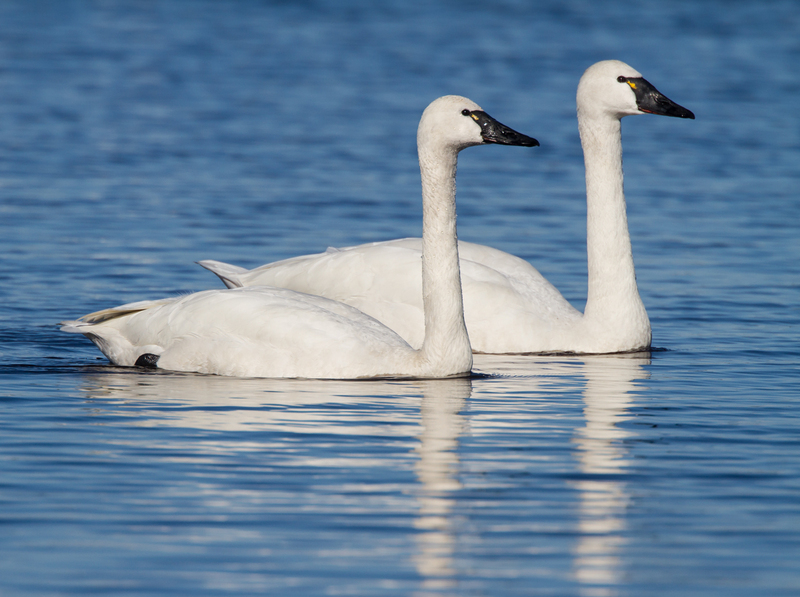 Their populations fluctuate and swans may shift between the two lakes. On Westlake Lake up to 17 swans have been seen at one time; this summer one pair had 5 cygnets. 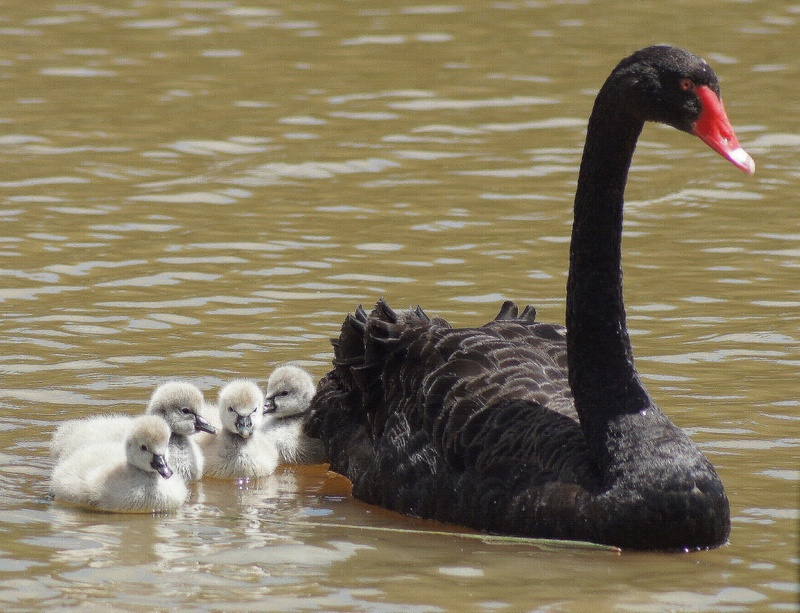 Swan families have been seen on Lake Sherwood, where birds can be quite defensive of their territories. Water levels of both lakes are significantly lower due to drought, numbers of swans are down, and a pair may have fled downstream to Malibu. Swans of any species are fairly scarce in Southern California, so here’s a bit of swan lore. There are truly seven swan species in the world. and a-swimming they all go. 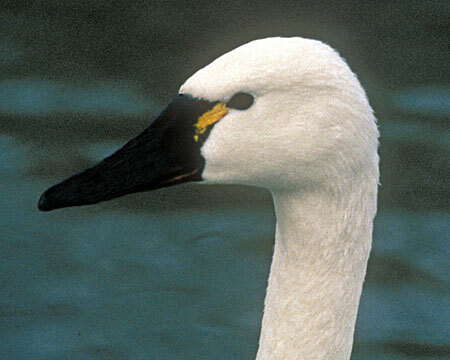 Of the seven, only Trumpeter and Tundra Swans are native to North America. Tundra Swans are regular winter visitors to Klamath and Tule Lake refuges on the Oregon-California border, as are a few Trumpeters and, very occasionally, a Whooper or Bewick’s (Eurasian race of the Tundra) appear. A small number of Tundra winter in the Sacramento Valley refuges, especially near Colusa. 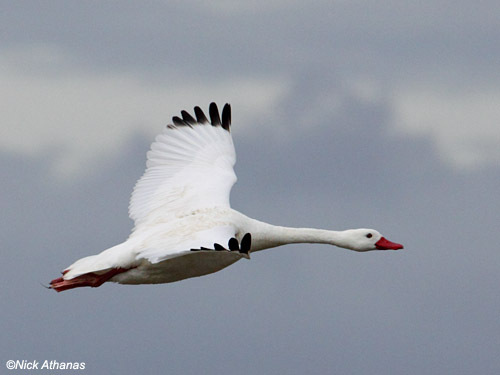 Tundra Swan is an occasional winter visitor to SoCal, but there are only a few SoCal records for Trumpeter. A few winters ago, when several Tundra Swans spent a few weeks at a small pond near the Antelope Valley Poppy Preserve, many L.A. birders drove out to see them. 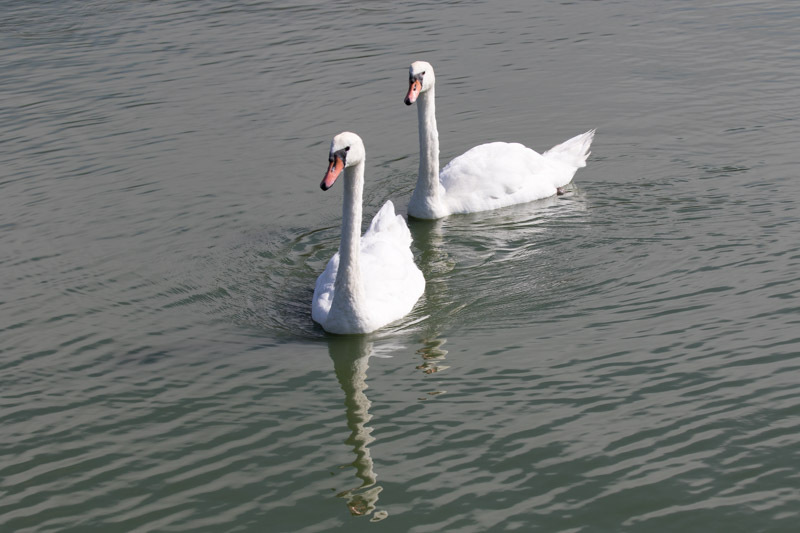 In general, swans form pair bonds at age 2 – 4, begin nesting at age 4 – 5, mate for life but will remate if the partner dies, and live for 15 – 30 years. 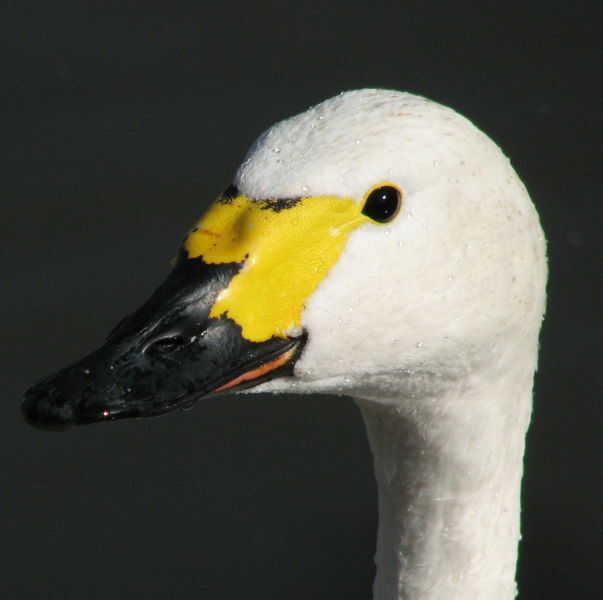 Swan Trivia: The Whooper Swan is the national bird of Finland, the Mute Swan is the national bird of Denmark, and the Black Swan is the state bird of Western Australia. 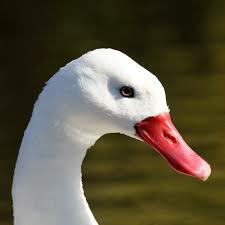 The phylogeny of the Coscoroba Swan is still uncertain: some scientists think it is most closely related to the whistling ducks, but recent evidence suggests that it is most closely related to the Cape Barren Goose of southern Australia, currently considered the world’s largest goose. In middle Pleistocene times (780,000 – 125,000 years ago) the Giant Swan Cygnus falconeri lived in Sicily & Malta. Up to 83 in. long, it was about 1/3rd larger than the Mute Swan, taller than the dwarf elephants then living there, and may have been flightless. Black C. atratus 8 – 19 63-79 43-56 10-100 20 (40) Australia-N.Z. Black-necked C. melanocorypha 8 – 15 53-70 40-49 90 15 (20) S. So. Amer. Coscoroba Coscoroba coscoroba 7 – 12 61-62 35-45 13 20 (36) S. So. Amer. Note: The variety of answers and ranges available on the web for the above categories is astounding. The Trumpeter Swan’s maximum wing span, for example, ranged from 5 ft. to over 10 ft. Sources for the above data include: Cornell’s All About Birds, Birdlife Int’l, Wikipedia, Handbook of Birds of the World, and Audubon Society Encyclopedia of North American Birds. Mute Swans in North America are primarily domestic or feral birds, kept in private wildfowl collections or living in park ponds. Bird keepers commonly clip their bird’s primaries so they can’t fly away, but the large number of feral and escapee birds in our cities attest to how often they get away anyway. 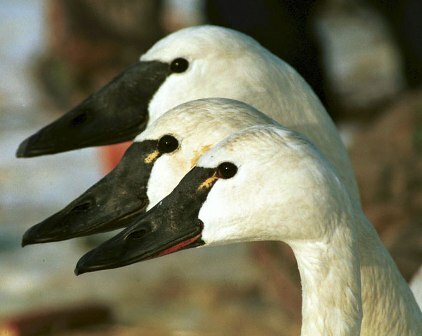 Sizable feral populations of Mute Swan exist along the east coast from Maryland to SE Maine, especially in Connecticut, in the Great Lakes – especially Traverse Bay, Mich., and a small population recently established itself on SE Vancouver Island. 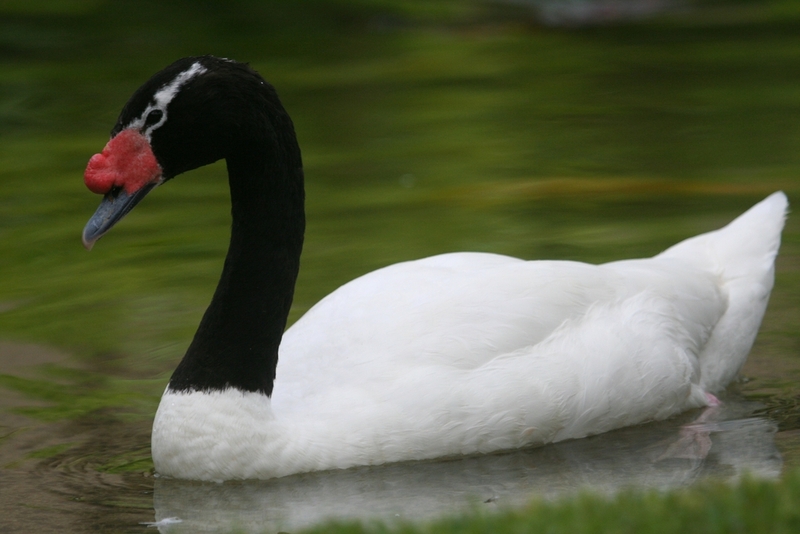 As lovely as Mute Swans are, with their all-white plumage, graceful S-curved neck, and orange bill – often down-turned – with black edging and a bump, they are considered a pest as they are aggressive, often driving other wildfowl from their nesting and feeding territories. Concerted attempts are being made to eradicate them from the Great Lakes region. The origin of the myth of Cygnus and its placement among the constellations in the northern sky has numerous versions. He was a pet of the Queen Cassiopeia (also a constellation). He was Cionus who, smothered by Achilles in a wrestling match, was saved when his father Neptune turned him into a swan. He was the famous musician Orpheus, murdered by drunken Thracian women, whom Zeus put into the heavens near his harp Lyra. He was Zeus/Jupiter, transformed into a swan in order to seduce Leda, and fathered Pollux (whose twin/half-brother, Castor, was fathered by Queen Leda’s true husband, King Tyndareus of Sparta). The immortal Pollux, grief-stricken when his mortal twin Castor died, asked Zeus to allow Castor to share his immortality, so Zeus turned these two heroes into the constellation Gemini, the Twins. According to Ovid (Metamorphoses II 374-382), Cygnus was a close friend of Phaethon who died while trying to drive the chariot of Sol, the sun god. His own grief transformed him into a swan and, abhorrent of the sun’s fire, he chose to live in damp marshes and rivers. However he got there, the constellation Cygnus contains the Northern Cross asterism, and was one of the original 48 constellations listed by the 2nd-century Greek astronomer/mathematician Ptolomy. See also Wikipedia. 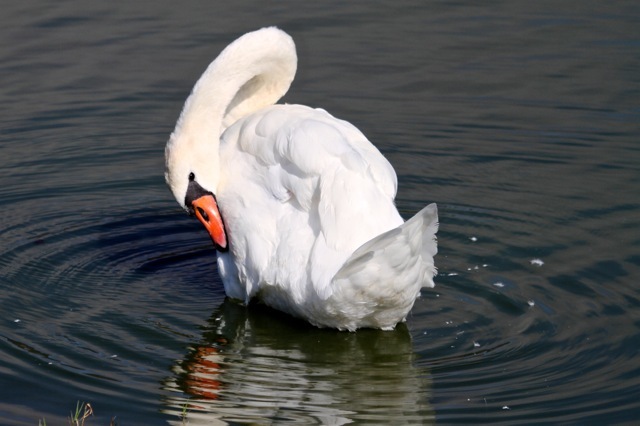 The swan song, Schwanengesang in German, and applied to the final performance or activity of a person’s career, derives from the belief that the Mute Swan sings but once in its life, then immediately dies. This story appears first in Aesop’s Fable, The Swan Mistaken for a Goose: “The swan, who had been caught by mistake instead of the goose, began to sing as a prelude to its own demise. His voice was recognized and the song saved his life.” It later appears in 458 BC in Aeschylus’ Agamemnon. Plato records Socrates saying, only slightly more accurately, that while the swan does sing at other times, its final song is the best. Aristotle claimed they “are musical, and sing chiefly at the approach of death.” By the 3rd century BC, the “swan song” belief was proverbial. 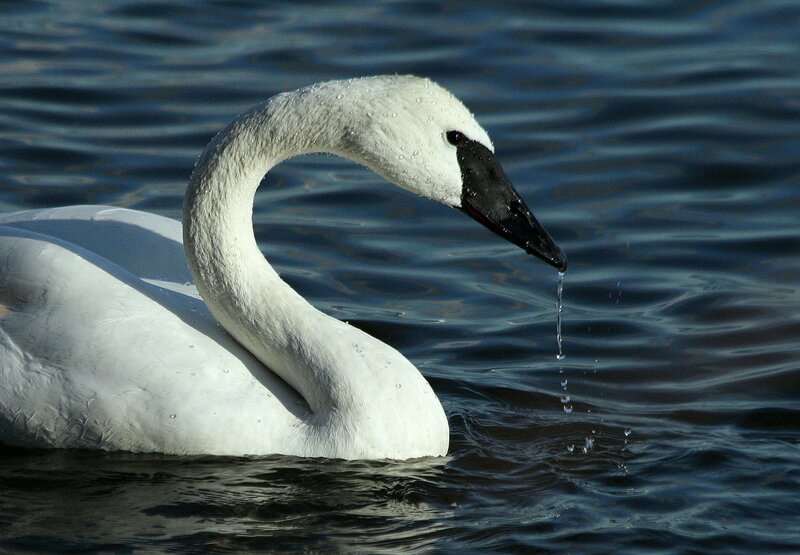 In fact, Mute Swans do make weak honking, barking and hissing noises. But a beautiful song as it dies? Sorry…only a myth. One of my favorite ballets, primarily because of Tchaikovsky’s music, is Swan Lake. His ballet ends tragically: Prince Siegfried is tricked – much as Wagner’s Siegfried is tricked into rejecting Brünnhilde – into breaking his vow of eternal love for the swan queen Princess Odette (human only at night), dooming her to remain forever a swan. To escape the spell laid upon her by the evil magician Von Rothbart, she chooses to die, the prince chooses to die with her, they drown themselves in the lake but are then reunited eternally in love. Again, the underlying myth has various versions, some happy, some tragic. One version has a hunter stealing the feather robe of a swan maiden as she, temporarily human, bathes. They marry, but when the robe is found and brought to her, she dons it and flies away. The husband searches for her the world over, finally finds her in the land “east o’ the sun, west o’ the moon” and they live happily ever after. This is one form of the innumerable were-animal tales found around the world. Every culture creates their own versions utilizing their own local wildlife: North Atlantic peoples have selkie (seal-people) stories, Greeks had centaurs (horse-people), Inuit have bear-people, Asians have tiger-people. The pair maintains a large territory, often an entire pond or small lake, although in some locales such as Abbotsbury Swannery in southern England, they nest in colonies. The nest is a large pile of aquatic vegetation and sticks, lined with feathers and down, located on a small island or embankment. They vigorously defend the nest against all intruders, including dogs and humans, and they can be dangerous. 4-6 gray or blue-green eggs are laid and incubated an average of 35 days, usually solely by the female, with the male protecting her and and replacing her when she forages for food. The light-gray downy precocial chicks stay in the nest for one day before they are taken to water. Often the male takes the first cygnet to hatch to water, while the female continues to incubate the rest of the eggs. Chicks often ride on the parent’s back or under their wings. First flight can occur 100 – 155 days after hatching. Both male and female adults have a black knob at the base of the bill. During the breeding season the male’s knob swells, becoming noticeably larger than the female’s. Outside of breeding season, the knobs are little different. Although they are widely introduced around the world, their native nesting range is from Great Britain, across Europe and central Asia to at least Lake Baikal. Their wintering range includes north Africa, the Near East, NW India and Korea. Well over half of the estimated 600,000 world population of Mute Swan nest in areas of the former Soviet Union. Due to their fragility, bird bones neither fossilize well nor remain intact, but parts of Mute Swan bones have been found in Ireland, England, France, Portugal and Italy, dating to about 6000 years old in England and 13,000 years old in France. 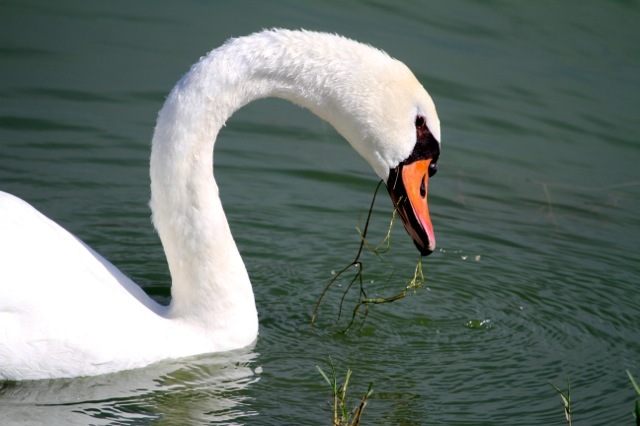 Fragments have been found in the western U.S. which belong to either mute swans or allied ancestors. Most sources say Mute Swans were introduced to the U.S. in the mid-1800’s in the vicinity of Long Island and the lower Hudson river, the area where most Mute Swans are still found. A large feral population lives on the coast of Connecticut and can be seen swimming in Long Island Sound. A Delaware population of about 40 birds are the recent result of a few captive birds escaping and breeding. Many states have proposed programs to cull or extirpate Mute Swans, and even more groups have sprung up to thwart such plans and protect the swans. 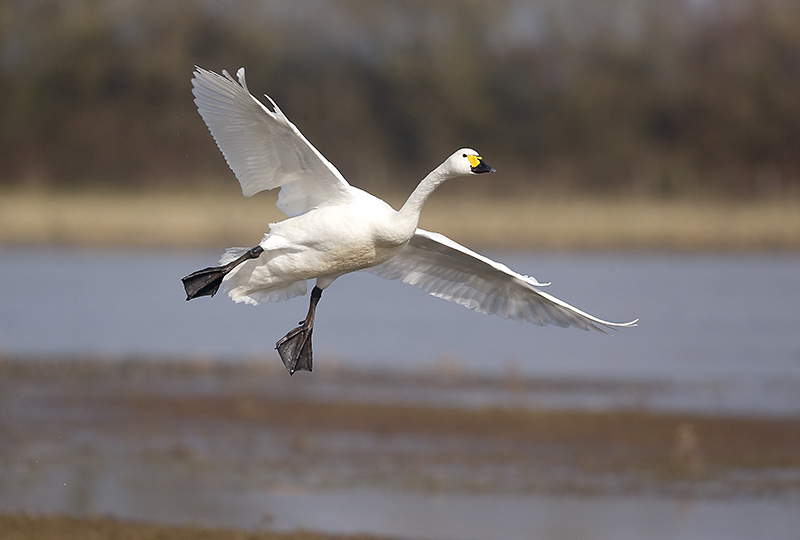 Some people hold that Mute Swans are actually circumpolar birds (as are many other wildfowl) and have long appeared in small numbers in North America, flying over from east Asia, accompanying the regularly migrating Tundra Swans. This might explain the old bones found in western U.S. states, especially at Fossil Lake, Oregon, including a recent find in the SE California desert of Anza-Borrego. If only for this reason alone, they say, Mute Swans should be considered native birds and harassment of them should stop. We don’t know the origin of these two swans (and please don’t write in to suggest “eggs”). 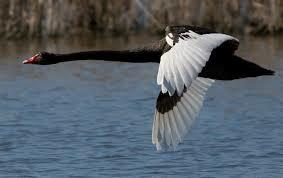 Fellow birder Aurelio Albaisa reported that a pair residing for several years at Lake Balboa have now disappeared. They were flight-capable and one had a blue band on its right leg. Whatever your view on Mute Swans, they are lovely birds. I hope you visit them at Malibu Lagoon before someone decides to remove them or they choose to fly away. ← Does this make it eOfficial? Chuck–a thoroughly enjoyable and educational piece. Loved the mythology inclusion. Appreciate the links to various swan websites and articles. As you no doubt know, we observed a Tundra Swan at the Pico Rivera Spreading grounds last year. I don’t know the origins of the Malibu swans but there are several ‘resident’ mute swans on Westlake Lake and one couple this year had 5 cygnets. I’ve been enjoying watching them as they mature through the summer. The population of mute swans fluctuates on the lake and I suspect they share time between Lake Sherwood, where I’ve seen swan families as well in the spring, and Westlake Lake. I observe them while kayaking and it’s a real treat. Thanks for the article. Thanks, Jeri. I’m going to wait a few days to see if any more info comes in from readers, then update the blog.